Keeping kids active and entertained during the summer can be challenging. I try to send mine outside as much as possible. 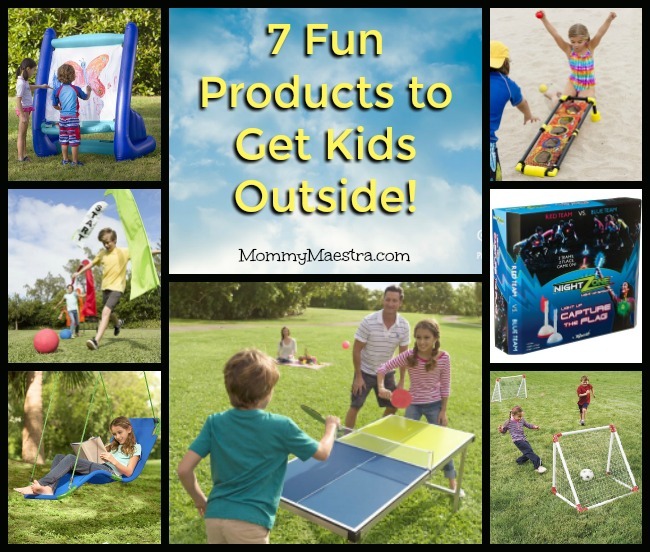 But sometimes I need fun games or other products to encourage them to spend that time outdoors. One of my go-to resources for inspiration is Hearthsong. This year is no exception. Here are seven products I found on their site that are super fun. I'm listing these in order of age range, starting with products that the youngest kids can enjoy. Goooool! 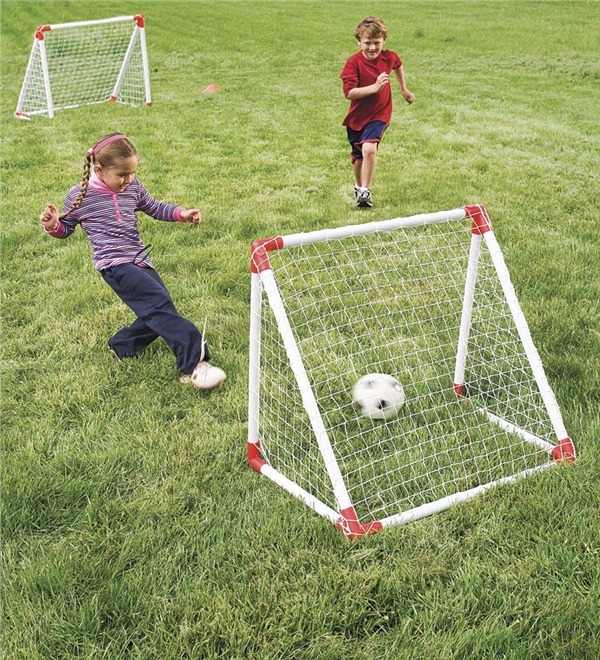 Great goals for younger soccer players, these nets are incredibly versatile! The two high-impact vinyl nets fit easily in the backseat of a car, along with the set's 6" PVC ball, 4 safety cones, inflating pump, and 8 ground stakes. 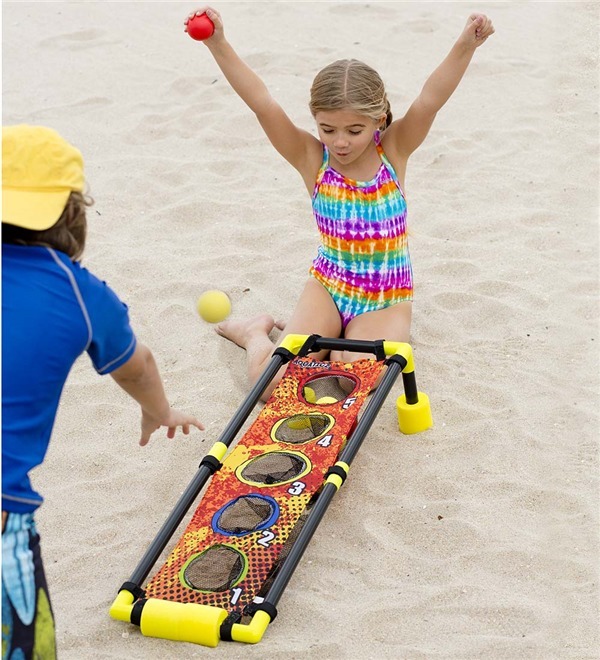 Take them to the park or school or the beach; use them on any surface, and have a great game! Nurture your child's inner Diego Rivera!! 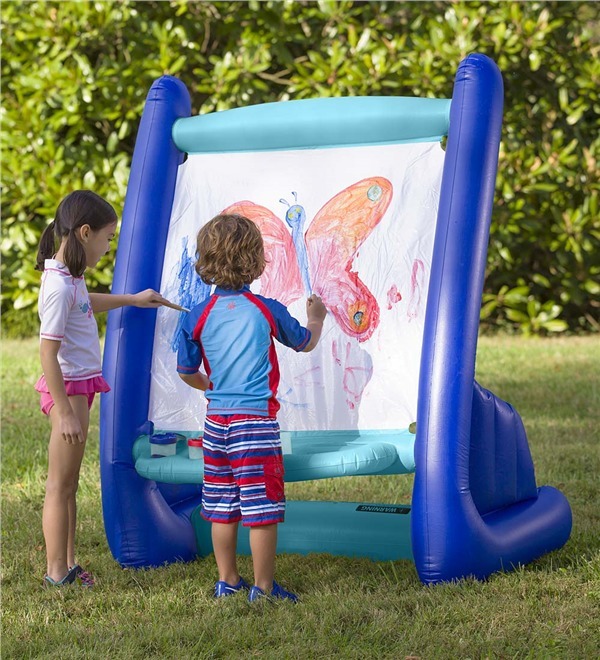 How fun is this inflatable easel? It's huge! Enjoy art anywhere—even (and especially) outdoors—with this heavy-duty vinyl inflatable easel. It makes a popular gathering place at birthday parties and play dates, where kids can paint (or finger paint) with abandon right on it, then just hose it off to be ready for another day. Includes four paints, four shaped sponges, and a paintbrush. Just inflate to start creating. Approx. 5½'H. My kids so want this!! Reading outside in a hammock is one of life's greatest pleasures and a wonderful way to raise a reader. 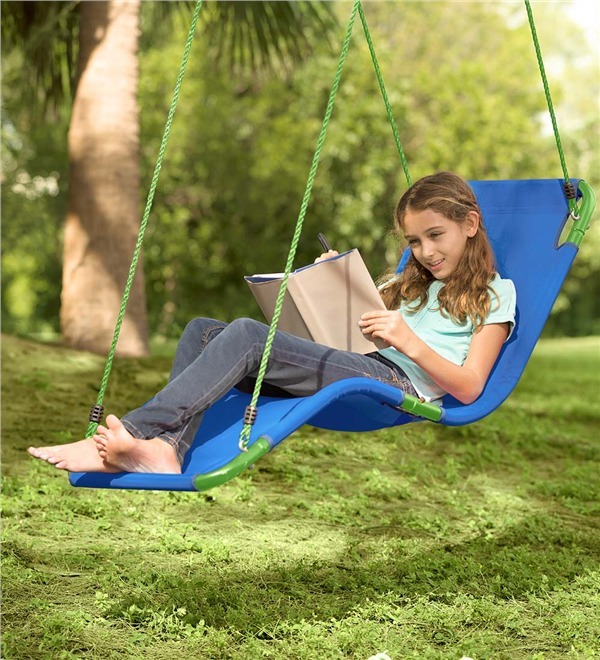 Wherever your favorite place to hang out may be, this Hanging Lounge Chair will hang there to really get comfort off the ground. Made of softest polypropylene, it's still heavy duty. It’s a great way to stay home and get away to places where dreams are born. Approx. 54"L x 20"W.; 200 lbs. maximum weight limit. Adult installation required. When it comes to outdoor family fun, these flags lead the way! 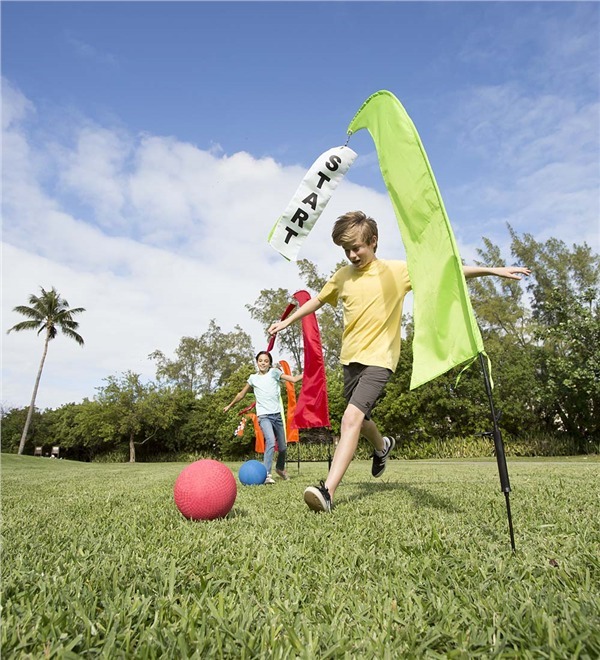 The Quest's six large course flags and 10 mini marking flags (2 start, 2 checkered, 6 numbered) make it easy and fun to create easy-to-follow courses for exhilarating outdoor games, including obstacle courses, relay races, agility courses, egg-and-spoon races, and more. Also includes a carry bag for easy portability to picnics, family reunions, gym classes, the backyard, craft fairs, and more — you'll also have fun discovering other uses for them. Adult assembly required. Fun on the run! My kids LOVE ping-pong! I wish that I'd had this table for them when they were smaller. It would have provided endless hours of fun - year round, too! This favorite family game folds to go wherever the family goes, and sets up in seconds. 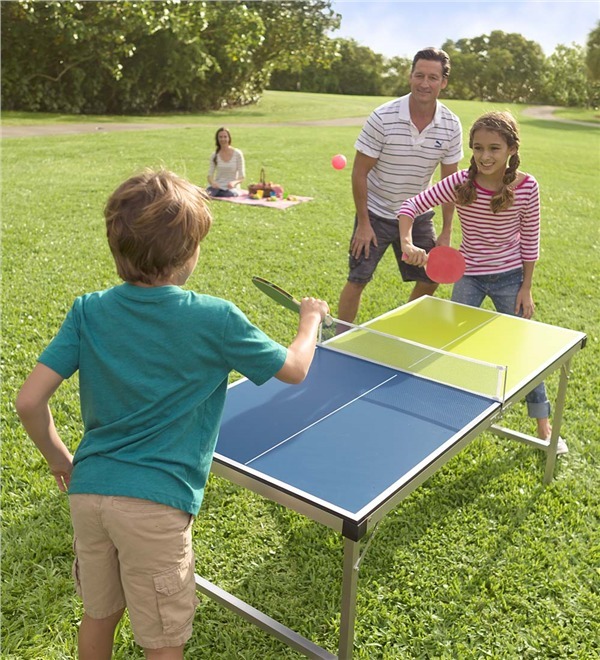 Carefully crafted to replicate a regulation ping-pong table except for the size (which is close), it goes from a standing 59"L x 27" x 26" to a portable, packable 30"L x 27" x 5" in a snap. Includes net, two colorful paddles, and three balls, and weighs 29 lbs. Adult assembly required. This amphibious five-hole target sets up on an angle so you can toss, bounce, or skip balls into it—in the water or on land! A rousing addition to any outdoor-game collection, this versatile target is molded of EVA foam and includes 6 EVA foam balls and baskets to catch them. Approx. 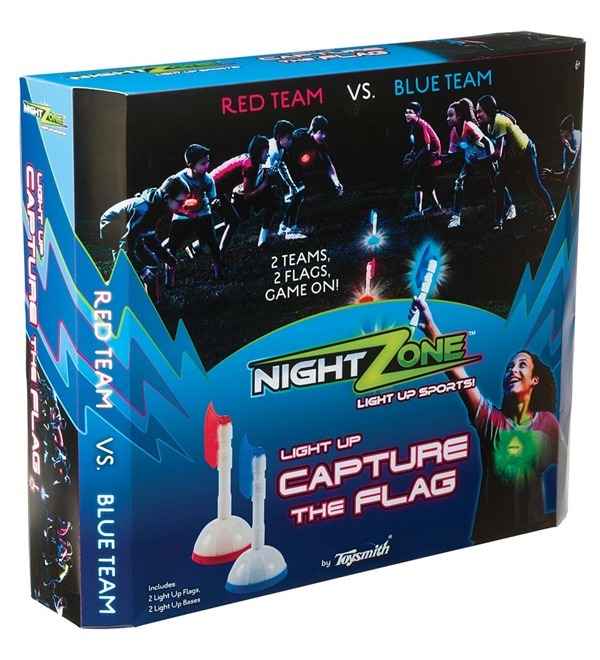 33½"L x 8¼"W.
Capture the Flag, the traditional outdoor-active game that keeps kids moving and smiling all summer long, is especially exciting at night, thanks to this game set’s two light-up flags (and included two light-up bases). There are many ways to play the game, all of them fun! Capture the Flag requires a playing field of some sort. Whether indoor or outdoor, the field is divided into two clearly designated halves, known as territories. Players form two teams, one for each territory. It is also suggested that teams wear dark colors at night to make it more difficult for their opponents to see them.